Tom Marwick completed training in medicine and cardiology in Australia, before undertaking an Imaging Fellowship at Cleveland Clinic, a PhD at the University of Louvain, Belgium and a Masters in Public Health at Harvard. He is Director of Baker Heart and Diabetes Institute, and has divided his career mostly between Australia (formerly at the Menzies Institute for Medical Research and Professor of Medicine and Head of Cardiovascular Imaging Research Centre, UQ) and the USA (former Head of Cardiovascular Imaging at Cleveland Clinic). His main contribution has been in clinical research and research training, and has supervised about 30 research higher degree students – mainly clinical – including 22 completed PhDs. He was one of the initiators of stress echocardiography, and has made contributions to the prognostic evidence underlying cardiovascular imaging. His main current research interests relate to the detection of early cardiovascular disease and cost-effective application of cardiac imaging techniques for treatment selection and monitoring. He has published over 650 papers, reviews, chapters and editorials, and is an Associate Editor at JACC and Deputy Editor at JACC-Cardiovascular Imaging. Professor Marwick has been the recipient of more than fifty significant research grants and several awards, including the Simon Dack Award from the American College of Cardiology, 2009 and the RT Hall Prize (2006) and Kempson Maddox Lecture (2011) of the Cardiac Society of Australia and New Zealand. The Arthur Cobbold Memorial Lecture has been established by the University of Tasmania and Dr Elizabeth Cobbold as a memorial to Arthur's contribution to the School of Medicine, and to medical education. Emeritus Professor Arthur Cobbold AM OBE died in December 2009 after a distinguished career in medical education. 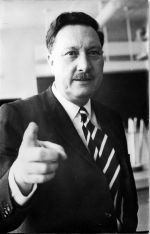 Professor Cobbold had been recruited from the UK in 1964 as Foundation Professor and Head of the Department of Physiology in the new Tasmanian School of Medicine. He played a pivotal role in the School's development and success, serving as Dean of the School for a record 13 years. Arthur Cobbold is widely remembered and acclaimed by his students and peers as an outstanding teacher and researcher and an excellent administrator. The Arthur Cobbold Memorial Lecture has been established by the University and Dr Elizabeth Cobbold as a memorial to Arthur's contribution to the School of Medicine and to medical education. Presented in partnership with the Medical Protection Society of Tasmania. Can't attend an event? Catch up with public lectures on the University of Tasmania Livestream Page!